In recent weeks I've asked for your good vibes in my posts. Well whatever you guys did, thank you, because it worked. My Dad put in for a house transfer quite some miles away and as it was a 4 way swap it had a higher risk of failing. We waited weeks on end to find out if we got the house. October 15th rolled around and we found out it went through and a moving date was set. I applied for a work transfer straight away and that's where things started to get a little difficult for me. I felt like work weren't really helping me. I had to put myself out of pocket and shell out money for a train to spend 10 minutes at my new store, and even then it wasn't definite that they'd want me. That's why posting has been so absent lately. I was just stressed and upset and I knew my heart wouldn't be in it as this was playing right at the front of my mind. I've wanted to get out of Barnstaple for such a long time. Yes, the beaches are wonderful. But I don't have friends here. There's nothing to do. The town centre is honestly diabolical for 'shopping' and still to the current day there's places shutting down on a daily basis. When I spent the week up with my Dad I felt so much better. I got to see some of my family who I hadn't seen for 8 or so years, along with others I've seen in more recent years. It's just a short train ride from London. I'm a 20 minute train ride away from my nearest M.A.C, Lush and department stores. I just really wanted it. I spent my whole week off stressing that I wouldn't get it. What other options did I have if I couldn't get a job transfer? Well I went back to work on Sunday but I had to wait till Monday to find out. After much stressing working 5-9 before I would know for definite, it turns out all that stress and upset was somewhat unnecessary as they obviously saw something they liked in me and offered me hours. To start as soon as I want. As next week is pay day I opted for Thursday being my last day. Just because moving with more money will be easier. I have 1 week left of getting up at 3:50AM every single weekday. I still can't quite believe it, I really feel like I'm dreaming. I'm also a little apprehensive as I've spent my entire life in the same area and for the most part, the same town. I'm packing up my life to move 4 hours way. Packing has to be the worst thing too, it's like tidying only much worse. So as next week is just going to be stupidly busy I won't have any posts up for the next fortnight or so. As I shall be getting a new room it also means I have free rein on decorating and boy am I excited! Mainly because I was never really allowed to do anything to the current bedroom I have (thanks Mum). The only piece of furniture I'll have will be my dressing table, everything else I will be buying from scratch. 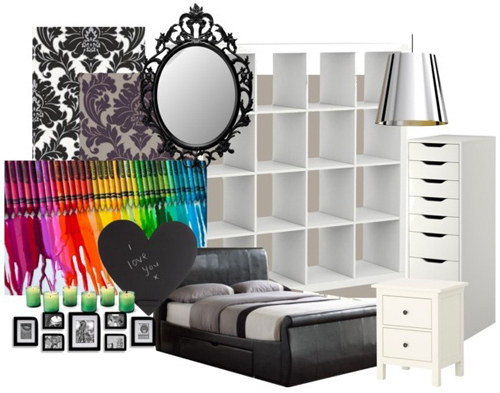 So here's a bit of a mish mash wishlist of things I want for my new room. Damask Wallpaper - I've loved the look of damask/vintage paper for a few years now. I was set on once I found a place and was settled in it, I wanted to do a feature wall with it. I haven't found the perfect roll yet but I know I want it to be very dark in colour or black. Ung Drill Mirror - Following on from my wallpaper, I think this mirror fits really well with it. Paint - For the paint on the rest of the walls I want to go with something quite pale but not verging on being to beige/cream as I can make the room stand out with splashes of colour. I'm undecided between a few different Crown paints. Taste Of Honey and Grey Lace are taking my fancy most currently. Expedit Bookcase - I've lusted after this bookcase for a while but I never knew where it was from until I read this post over on Milkteef. It's such an eye catching and statement piece for any room and you can have lots of wonderful things housed in it. Gnejs Lampshade - Just a cheap little shade. I much prefer subtle lighting rather than harsh overhead lighting so I don't tend to use my main bedroom light too much. I love the mirrored effect on this though. Melted Crayon Art - These have really been a hit with people in recent months. A bright, colourful piece of art that's easy to make and it gives a personal touch to any home. I love Milly's big melted crayon canvas that she did over on her blog. I love making things and this will bring a ton of colour to one of my walls. Accents - I want to accessorize with your typical accents. Things like candles, photo frames, cushions and wall art. Things that make the room personal to me. Manhattan Bed - Came across this when I was away, it's beautiful in person and the sort of bed I've wanted for ages. The extra under bed storage is also perfect! Hemnes Bedside Table - This isn't currently on the UK Ikea website (annoying much?) and I don't much like the other two tables in the Hemnes series. But it goes with my dressing table. If it doesn't come back by the time I want to buy it, I may switch over to the Malm and get a bedside table and chest of drawers from that instead. All my furniture will be white so it should all go. Alex Unit - Something else I've eyed up for a while. Whilst my dressing table has a draw for makeup, it just isn't enough. This is the perfect size to have smaller things in the top and then keep things like hair straighteners and all sorts of other bits and bobs in the bigger draws towards the bottom. Those are my room ideas. I shouldn't think they'd waver to much now as I've been set on the same idea for a couple of years now. Sorry for the long post but I had lots to say!